ohn Godfrey Parry-Thomas was my great uncle who died in a tragic accident in 1927. He was the son of a vicar and born in Wrexham in April 1884. The family moved to nearby Oswestry when he was five years old and he was educated at Oswestry School where he is said to have raffled his sixpence-a-week pocket money at a penny a chance to as many takers as he could find. John was fascinated with engineering and studied electrical engineering at the City & Guilds Engineering College in London in 1902. 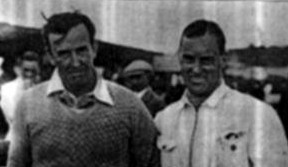 There he first struck a friendship with Ken Thomson, who would become his assistant at Brooklands (Thomson later went on to head ‘Thomson & Taylor’ and work extensively with Sir Malcolm Campbell in the later development of Blue Bird). By 1908 he had designed an infinite-ratio electrical transmission (now viewed to be 70 years ahead of it’s time!) and a partnership with Leyland saw it used in a London bus, railcars and a tramcar. Parry-Thomas was also much in demand on government advisory boards during WWI. After numerous jobs he became the chief Engineer at Leyland Motors. Leyland Motors investigated the possibility of building a massive luxury car. 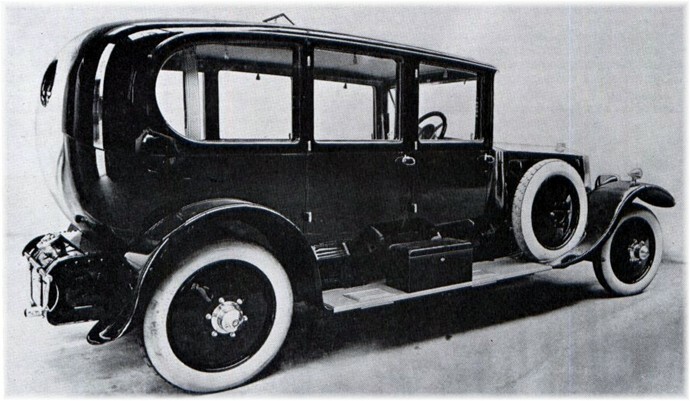 In 1917, he and his assistant, Reid Railton, started to design the Leyland Eight luxury motor car which was intended to compete with Rolls-Royce. 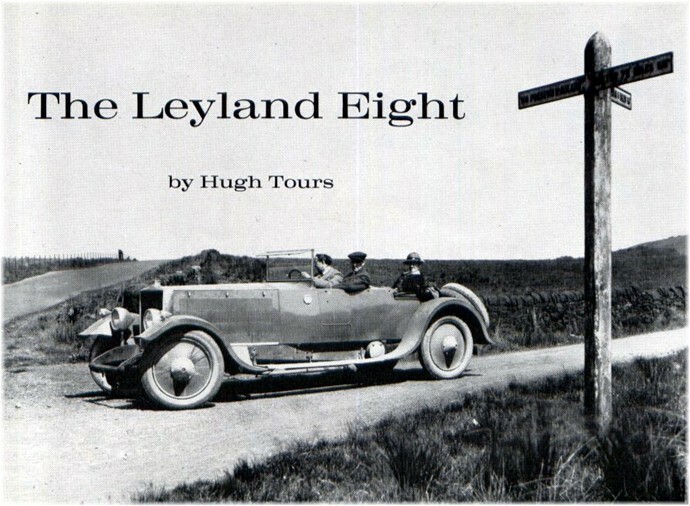 Aiming to make a perfect vehicle, the Leyland Eight was both magnificent and extremely expensive; in 1921 the car was available to the public at a cost of £2,700 for a five seater tourer. 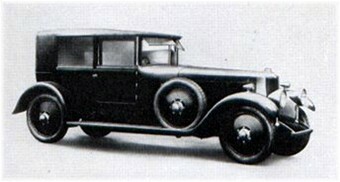 The imposing motorcar, the Leyland Eight, was dubbed the 'Lion of Olympia' when shown at the 1920 Motor show in London. The cars were expensive and only eight were built. John Parry-Thomas tested each Leyland Eight to 100 mph before delivery at a time when the WLSR was only 124mph! Altogether, 14 cars were made, including 2 for the Maharajah of Patiala and one for Michael Collins, the Irish revolutionary leader. 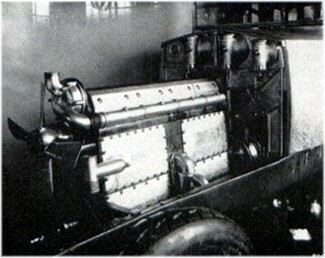 The cars were all fitted with different bodies and it was a Leyland Eight that Parry-Thomas used in his early competitions in 1922. 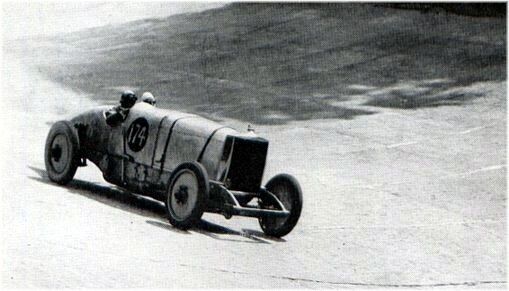 Despite the considerable reservations of the Leyland directors, Parry-Thomas raced one of the Leylands at Brooklands. Racing became important to him, and he resigned from Leyland to become a professional motor-racing driver. 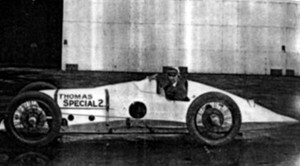 The split was friendly and Parry-Thomas was given several chassis and a quantity of spares. He went to live in a cottage in the grounds of Brooklands circuit. 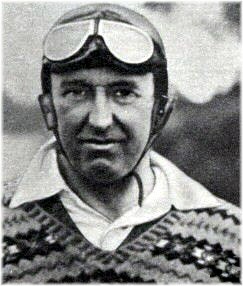 The racing world at this time had many famous characters including Count Zborowski who later died at Monza in 1924. 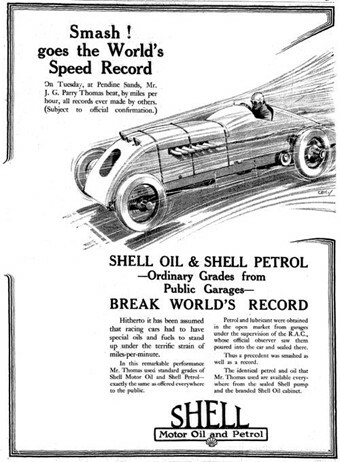 Parry-Thomas was able to buy a potential record breaking car, the Higham Special from Zorowski's estate. It was fitted with a 27,059 cc Liberty aero engine, Benz gearbox and featured a chain final drive. 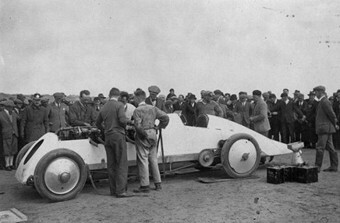 My great uncle christened the car 'Babs' and after carrying out considerable amount of work took it to Pendine for a crack at the landspeed record. This was in October 1925 but the weather precluded any chance of a record breaking run. To cap it all Henry Seagrave posted a speed of 152.33 mph. In April 1926 Babs was transported back to Pendine at Shell-Mex's expense for another attempt. After a couple of warm-up runs Parry-Thomas achieved a speed of 169.30. A day later he pushed the record over the 170 mph mark. 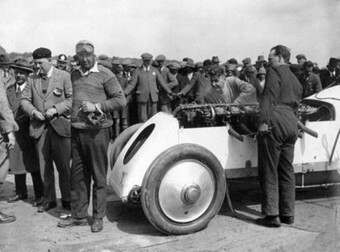 Campbell was among those who sportingly congratulated Parry-Thomas and, in the nature of the challenge, he prepared his own car for another attempt on the record. 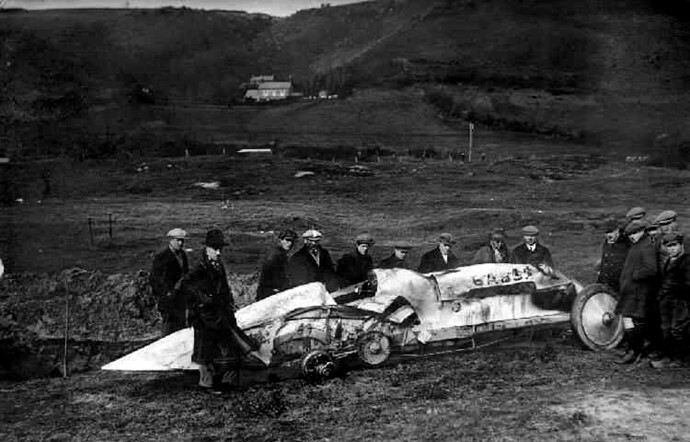 In January 1927 he achieved a top speed of 174.883 mph. 1926 was undoubtedly his greatest year - as well as numerous race wins he twice broke the mile & Km WLSR then went on to break another 8 speed records in October. 12 successful record attempts in 5 months. He even found time to offer some friendly advice to his friend Sir Malcolm Campbell in February 1927, concerning a gearbox problem in the new 'Blue Bird'. 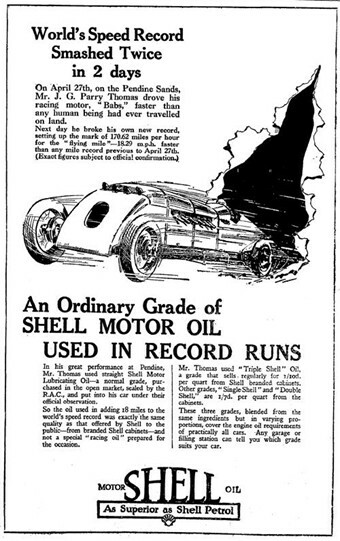 As the competition for the record increased Parry-Thomas wanted another crack at it; he knew Henry Seagrave was to attempt a run for 200 mph, in Florida. He arrived back in Pendine, unwell with 'Flu', in March 1927 and with the assistance of Shell and Dunlop staff began to prepare the car for a run on the beach. After the usual start and warm up procedures had been followed great uncle set off up the beach on a timed run. The car skidded, turned over and over and then slewed round to face the sea. The scene for those first to arrive was not pretty, Parry-Thomas was still in the car, he had a deep cuts to his neck, †partially decapitated and burned. The car was on fire and in order to retrieve the body from the blazing wreck two of Parry-Thomas's crew had the unpleasant task of breaking the legs of the corpse before the fire prevented them reaching it. 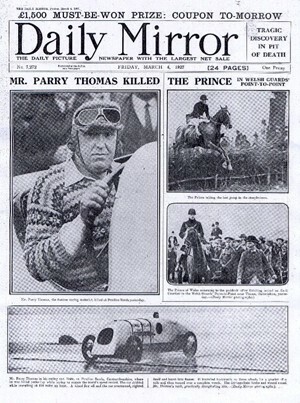 The coroner's verdict was accidental death and Parry-Thomas was buried at Saint Mary's, Byfleet, Surrey. The car was buried in a big hole on the beach and that could have been the end of the story. † A popular myth which is untrue is that he was fully decapitated in the crash. Babs being buried on Pindine Sands March 1927.
or the next bit of the story we jump 42 years in time and enter another Welshman, Owen Wyn-Owen an engineering lecturer form Bangor Technical Collage. Owen Wyn-Owen had restored several cars and was keen on the idea of digging up Babs from the sand with a view to a complete restoration. This was easier said than done simply because some of the locals didn't want the car resurrected while others did , and the army who had arrived during World War II were not too keen on the idea as the point where Babs was buried was now surrounded by buildings. Perseverance paid off and in 1969 the car was excavated and so began a 15 years of work to make Babs run again. After his death, it was found that John was also in the middle of designing a boat to attack the World Water Speed Record. Rather ironically, also on his drawing board were the plans to convert Babs from chain to shaft drive. 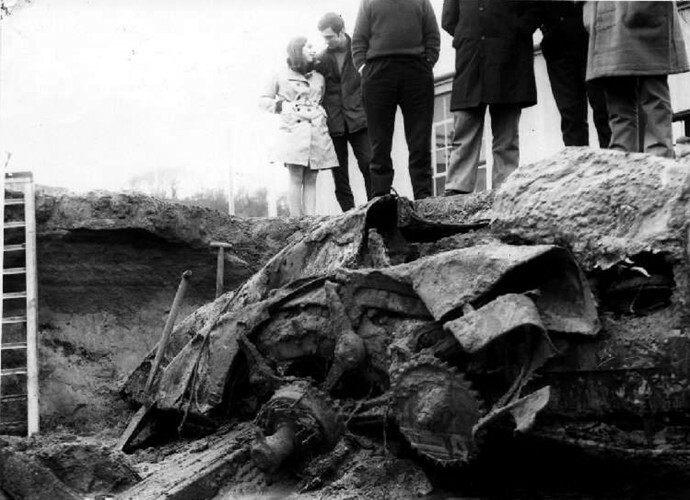 Babs being dug up in March 1969. John Godfrey Parry-Thomas was truly an understated genius as a driver and an engineer below are a few of his huge number of inventions that were patented between 1910 and 1926 these are in PDF format. † These remarks of Reid Railton are taken from his appreciation of J. G. Parry-Thomas in Parry-Thomas, Designer-Driver by Hugh Tours, B. T. Batsford Ltd, 1959.
small plunger pumps actuated by the rear quarter elliptic springs. A single-plate clutch connected the engine to the four-speed gearbox which was mounted on leather at each end and spigoted at the rear to prevent excessive movement. A starter-motor was built into the gearbox in order to enable it to cope with such a large engine, a practice that was not uncommon at the time. The latter end of the propeller shaft carried the differential which in turn drove splayed axle-shafts by means of twin bevels. (A spiral bevel axle was quoted in 1921.) The rear springs were unusual in that their first action was to twist a torsion bar after which the leaves themselves came into operation, a method which necessitated the heavy circular fixing on the inboard end of the rear springs visible on both the touring and racing versions of the Leyland. The front springs were semi-elliptic and, like the rear ones, had no shackles, each axle being held in place by stout radius rods. The brakes were vacuum-servo operated by a system evolved by Thomas, the patent of which he is reputed to have sold subsequently to Dewandre, but in the event of failure of the servo they could be worked by mechanical means. The steering gear incorporated two gearboxes and allowed the shaft to run down the driver's side of the scuttle and keep itself out of the engine compartment altogether. The top box permitted any angle of rake for the steering wheel. The production cylinder head showing the leaf valve springs. William Body in his book, The History of Brook- lands Motor Course, mentions three unusual items included in the specification. They were a suction governor to control the speed of the cooling fan, a suction-operated ignition switch which cut the coil circuit when the engine stopped, and a starter that functioned when the gear lever was placed in a certain position; the last idea being used on the DS.19 and Pallas models of the Citroën. 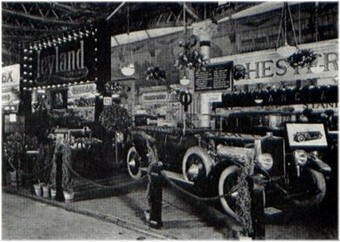 The Leyland's lighting and starting was by Smith, but in 1923 there is mention of a Brolt starter. The disc wheels were fitted with 895 x 135 mm. tyres. 'I note in the Correspondence of The Autocar of 4th June,' he wrote, 'that a large number of car owners and others are expressing their views as to which is the world's best car. One of them asks, "Where does the Leyland Eight come in?" 'As the designer of the Leyland Eight, I may say it never has been, and never will be, the makers' wish that any discussion such as this should take place, it being their intention to produce the most perfect car it is possible to design and manufacture. It may, however, interest you to know that the only car which we consider worth while having as a sparring partner to the Leyland Eight is the Rolls- Royce. The Leyland Eight is not, and will not be until next year, in the hands of the public, and of the cars that are in the hands of the public, in the writer's opinion, there is not one which can hold a candle to the Rolls-Royce. The two-door open model showing a fitted starting handle. One of the first cars to be built showing an early form of trade plate. An alloy body is fitted for test purposes. 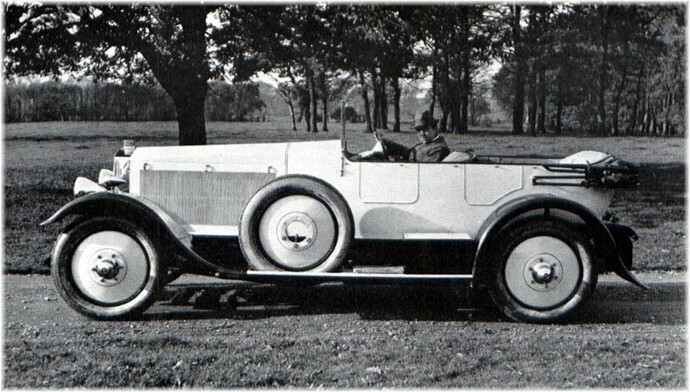 The 1920 Show model with special coachwork. 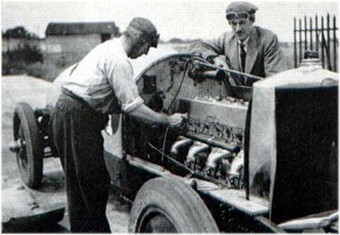 J. G. Parry-Thomas making adjustments to the Leyland at Brooklands in August 1923 while Capt.J E. P. Howey looks on. 'I notice that you have described the car driven by myself as a two-seater. As a matter of fact, it was a four-seater touring car, being the original car built in 1920.
point. 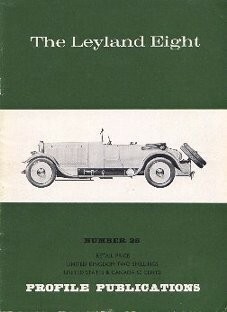 In this guise the Leyland ran in races and competitions until 1924, a sister car being constructed in 1923 for Capt. 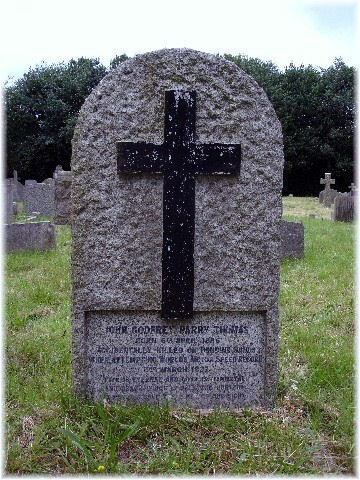 J. E. P. Howey. 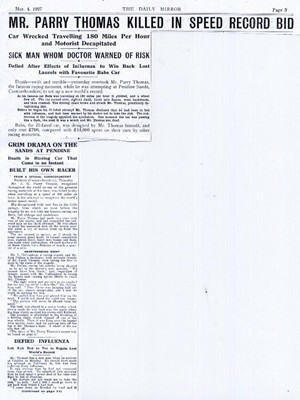 It was during the winter of 1922 that Thomas severed his connection with Leylands. It was a per- fectly amicable arrangement and the directors of the firm were particularly kind and understanding. Their case was quite simply that Thomas could spend his time racing at Brooklands or as their Chief Engineer but obviously not both. He was not in two minds as to what he wanted to do and so he was allowed to take several complete chassis and any spare parts that he needed and settle into the bungalow and garages actually inside the track at Brooklands where he was to live for the remaining years of his life. 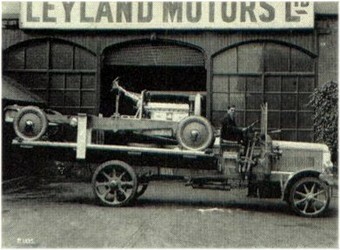 The gift of the Leyland Eight chassis was an extremely generous gesture even though it had been decided to discontinue production. A slump in trade was not in the least favourable to the sale of a very expensive motor car and the Leyland shareholders held strong views about the projects for which their money was being used. Thus, one might say that as the ex-Chief Engineer started on his upward course of popular success, his Leyland masterpiece came to a standstill, the exception being his own car and to a lesser extent that bought by Capt. Howey. These cars did anything but stand still. 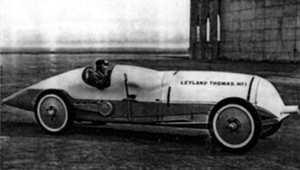 In his first season at Brooklands, Thomas's Leyland was placed no less than fourteen times, 4 firsts, 7 seconds and 3 thirds. This result was considerably improved upon in 1923 when the Brooklands placings were 8 firsts, 4 seconds and 1 third. The famous Leyland-Thomas No. 1, which with Thomas at the wheel was to become a legend of Brooklands Track, was built from the previous racing car during the winter of 1923. A much lower body was fitted, having, it was claimed, a head resistance reduced by 40 per cent; a long pointed tail now ended much nearer to the ground. Behind an oval opening in the streamlined cowl nestled a new circular radiator, while under the bonnet the straight-eight engine had undergone considerable modification. 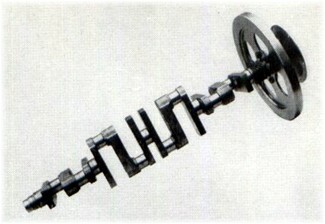 A redesigned crankshaft permitted the raising of the compression- ratio to 7-5 to 1 and dealt with the 200 b.h.p. now obtainable at 2,800 r.p.m. To produce this power four Zenith carburettors were fitted while the exhaust and inlet ports and the camshaft were redesigned. The car was painted white with the chassis, underparts and the six-stud flat disc wheels in pale blue. It was to become one of the most successful cars ever to be seen at Brooklands. 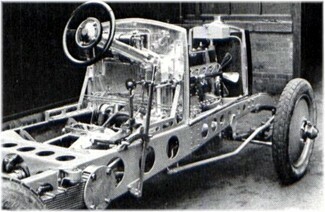 The Leyland Eight with its first racing body. Mrs George Duller at the wheel in September 1923.